Users of the previous version of ChaRT will notice changes to the the interface and necessary inputs. Providing information about an aspect solution is the major new feature of ChaRT v2. In lieu of azimuthal and off-axis angles, ChaRT now allows users to input celestial coordinates. Exposure time is no longer tied to the source spectrum. The spectrum file has been changed to a 3-column (energy_lo, energy_hi, photon flux) format. For a monochromatic source spectrum, the ray density parameter has been replaced with a photon flux value. Additional details of these changes, and how to handle them, are described in this thread. This thread shows how to determine the parameter values needed to run ChaRT: the coordinates, spectrum, and telescope aspect solution. It is important to read the caveats before running ChaRT and using the resulting PSF simulations in analysis. Last Update: 12 Apr 2016 - updated to make use of fixed sherpa_contrib.chart Python module. This thread assumes that the data have been reprocessed using the chandra_repro script. The Chandra PSF varies significantly across the field of view. It goes from sub-arcsec FWHM near the optical axis to over 100 arcsec at the extreme edges of the detectors. As such, the location of the source in the field is required to run ChaRT. The location can be entered in either celestial coordinates, Right Ascension and Declination (decimal degrees or sexagesimal format) or in Chandra off-axis angle, θ and ϕ, mirror spherical coordinates. ChaRT now allows users to input celestial coordinates which is now the preferred coordinate system. Figure 1 shows the data for OBS_ID 942. The coordinates for the source have been manually selected and are shown in the pop-up window. An image of OBS_ID 942, NGC 4244 (no energy filter applied). The left frame shows data for the entire observation. The right frame is zoomed into the source that is going to be analyzed in this thread. Alternatively, users can simply read and manually record the values from the fk5 line in the information panel. This shows that this source is approximately 5.975 arcmin offset from the optical axis (theta) and 197.86 degrees rotation in azimuth (phi). The Chandra PSF varies with energy as well as position. ChaRT allows users to specify the spectral shape as either a single monochromatic energy or allows the user to upload the spectrum as a file. Veteran ChaRT users will also notice that exposure time is no longer tied to spectral shape. Information about observation duration is discussed below in the aspect solution section. Users may upload a file describing the spectrum of their source. The format of the file is any format support by the CXC Datamodel (FITS and various ASCII formats). The file must be a table with only 3 columns. The first two columns must be the lower and upper energy boundaries, in keV; the values must be between 0.2 and 10.0. The 3rd column is the photon flux in units of photon/cm2/sec; the values in the flux column must be > 0. The names of the columns and any other meta-data (ie keywords) are ignored. and then fitting it with sherpa. In the example below the spectrum is fit with an absorbed powerlaw. Figure 2 shows a plot of the modeled source spectrum, that is the spectrum of the source at the entrance of the mirrors. 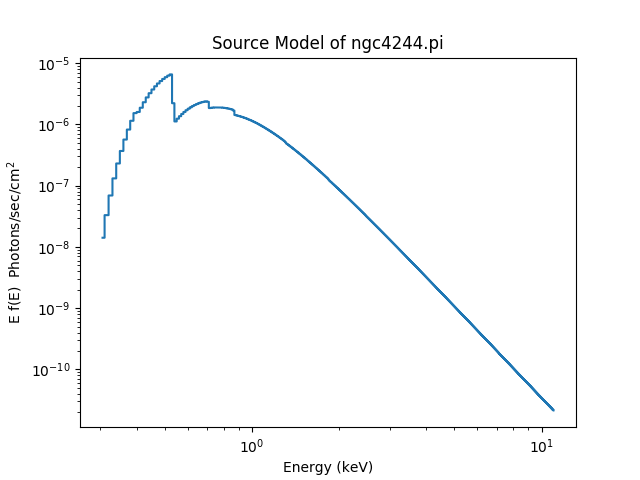 The source spectrum using the best-fit model parameters for an absorbed powerlaw model fit to the data. The save_chart_spectrum() command from the sherpa_contrib.chart module may be used to create the output spectrum file to be input to ChaRT. In this example, we use the optional elow and ehigh arguments to restrict the output to the 0.4-6 keV range. 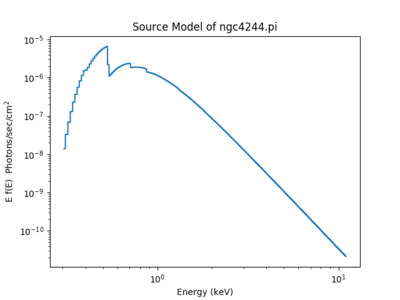 If the bounds are omitted, the full energy range as determined by Sherpa is used. The file source_flux_chart.dat is now ready to be uploaded to ChaRT. The value 0.01 is the step size in energy from the original file. The file new.dat will be written in FITS format. Users who wish to keep the file in ASCII format can specify the kernel option. ChaRT can use either ASCII or FITS format spectrum files. Users can simulate a PSF with a monochromatic energy between 0.2 and 10.0 keV. The Selecting a Monochromatic Energy Why topic provides some guidance on how to select the energy for a given assumed spectral model and energy band. As the energy dependence is not strong, an energy near the middle of the energy band is often sufficient. Users must also specify a value for the photon flux of the source, in units of photon/cm2/sec. The value must be between 1.0E-2 and 1.0E-9 photon/cm2/sec. Previous versions ChaRT required a ray density when users supplied a monochromatic energy. This has been replaced with a photon flux value. Users, especially veteran ChaRT users, may be tempted to input the maximum flux value to generate a simulation with the most number of rays. This may lead to unexpected results, particularly if using MARX to simulate pileup. As the flux increases so will the simulated pileup which can distort the PSF in ways that may not match what was observed. Instead, users should run multiple simulations and average the results as is discussed in the Using MARX to Create an Event File from ChaRT Rays thread. So for this source, using a monochromatic of 2.3 keV (the characteristic monochromatic energy for the broad, 0.5 to 7.0 keV, energy band) a flux of 1.7e-4 should give a PSF which provides a good match for the observation. The ability to provide information about the aspect solution is the major new feature in ChaRT v2. The aspect solution describes the pointing of the telescope as a function of time. Most observations are performed where the pointing of the telescope follows a Lissajous pattern. This has the effect of sampling a small range of off-axis angles around the source position resulting in a blurring of the PSF. A simple symmetrical blurring may be insufficient to model this effect, especially in short observations where the aspect solution may not uniformly sample the true distribution of off-axis angles around the source location. ChaRT also uses the duration of the aspect solution as the exposure time. Rays will be generated with TIME values between the aspect solution file's first and last time records. The exposure time of the observation cannot be artificially extended. ChaRT will retrieve the latest version of the aspect solution file(s) from the Chandra archive. If there is more than one file, it will dmmerge them together before using them. User is using an older processing version of the data products. 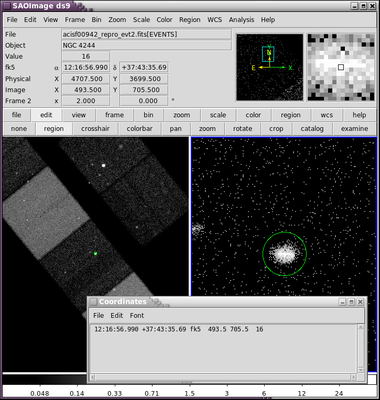 The CXC encourages users to make use of the latest version of data products available from the Chandra archive and recalibrate them with the latest calibrations available; however sometimes that is not always practical. chandra_repro applies the latest calibrations to the event file, not the aspect solution. Downloading files for ObsId 942, total size is 13 Mb. If any of these conditions apply, then users must choose from the next two options. Under the conditions above users may need to upload their aspect solution file to ChaRT. The aspect solution is necessary to correctly sample the distribution of off-axis angles the source is observed by. This is especially necessary when attempting to use data binned at subpixel resolutions. Some observations have more than one aspect solution file. These files need to be merged together before uploading to ChaRT with dmmerge. The default header merging rules lookup table is inappropriate for aspect solution files so a custom file must be used. This same merged file must then be used with MARX or psf_project_ray when the rays are projected onto the detector. Files that are gzip'ed are also acceptable. The final option for users doing analysis that does not depend on a particular observation is to supply a nominal value for the RA, DEC, and ROLL. These values must be sensible when the source position is input in celestial coordinates. Users working directly with off-axis values (theta and phi) can set these values to 0.0. Users who specify a value the nominal pointing must also supply an exposure time. This must be between 1 and 200 ksec. ChaRT simulations may take a long time and are therefore run asynchronously. Users will receive an email when their job is complete with instructions for retrieval. Emails will be sent from cxc_rays at head.cfa.harvard.edu. This address is an unattended account. Users who require statistically different ray files should specify unique values for the random seed parameter. A value of -1 will use a value based on the time the job was submitted. The value is stored in the header of the output file. As the time of the simulation is fixed by the duration of of the aspect solution and the flux is limited due to pileup, users may need to run multiple simulations. These independent realizations of the PSF can then be combined (averaged) to reduce the statistical uncertainty in the PSF. ChaRT will automatically pick a different random seed for each iteration after the first. Since all the necessary information has been obtained, you are ready to run ChaRT. 15 Apr 2009 The chart_spectrum script has been renamed to the sherpa_contrib.chart module; the write_chart_spectrum() has been renamed save_chart_spectrum(); the old version of the script and routine have been retained but are now deprecated; ahelp files are now available for save_chart_spectrum, plot_chart_spectrum, and get_chart_spectrum. 12 Jul 2010 the S-Lang version of this thread has been removed. Please contact CXC Helpdesk if you require the S-Lang commands for creating a spectrum file. 19 Apr 2011 The run ChaRT link points to the new web interface. 29 Mar 2013 Update file version to N004. 03 Apr 2014 Include asol file download, and go to appropriate sub-directory. 06 May 2015 Rewritten for new ChaRT 2 update. Users can now specify either celestial or off-axis coordinates. Users can supply an aspect solution, and the format of the spectral information has changed. 12 Apr 2016 updated to make use of fixed sherpa_contrib.chart Python module.